This edition of Critical Infrastructure presents a culmination of ongoing research and real-work experience, building upon previous editions. Since the first edition of this work, the domain has seen significant evolutions in terms of operational needs, environmental challenges and threats – both emerging and evolving. This work expands upon the previous works and maintains its focus on those efforts vital to securing the safety and security of populations. The world continues to see a shift from a force-protection model to one more focused on resilience. This process has been exacerbated and challenged as societies face increased instability in weather and arguably climate, a destabilized geopolitical situation, and continuing economic instability. Various levels—ranging from international oversight to individual actions—continue to work towards new approaches and tools that can assist in meeting this challenge. This work keeps pace with the key changes that have occurred since previous editions and continues to provide insight into emerging and potential issues. Expanding from historical research, major areas of interest such as climate change, regulatory oversight, and internal capacity building are explored. This work provides a reference for those that are working to prepare themselves and their organizations for challenges likely to arise over the next decade. 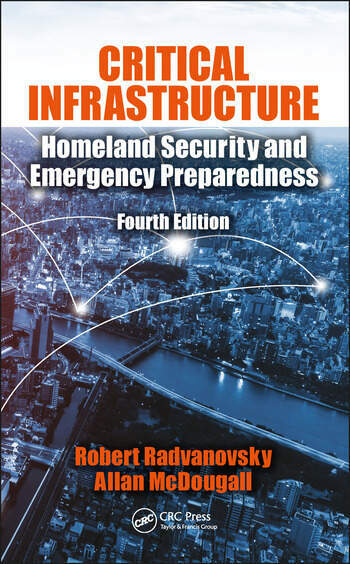 In keeping with the fast-changing nature of this field, Critical Infrastructure: Homeland Security and Emergency Preparedness, Fourth Edition has been completely revised and fully updated to reflect this shift in focus and to incorporate the latest developments. An enhanced and improved view of interdependencies in an increasingly inter-connected and network-enabled world. Preparing for the challenges of increasingly unstable threat and operating environments will pose challenges at all levels. Those involved in ensuring that critical infrastructure protection and assurance efforts function effectively and efficiently—whether as government regulators, business operators, clients of various infrastructure sectors or those seeking to maintain an accountable system – will find insights into less-explored aspects of this challenging field. Bob Radvanovsky is an active professional in the United States with knowledge in security, risk management, business continuity, disaster recovery planning, and remediation. He has significantly contributed toward establishing several certification programs, specifically on the topics of critical infrastructure protection and critical infrastructure assurance. Bob has special interest and knowledge in matters of critical infrastructure and has published a number of articles and white papers regarding this topic. Although he has been significantly involved in establishing security training and awareness programs through his company, Infracritical, his activities include working for several professional accreditation and educational institutions on the topics of homeland security, critical infrastructure protection and assurance, and cyber security. He is the owner of the SCADASEC mailing list for SCADA and control systems security discussion forums, while working as an active participant with the several U.S. Department of Homeland Security Critical Infrastructure Protection Advisory Council (CIPAC) working groups. Additionally, he has written numerous books pertaining to critical infrastructure protection and assurance, homeland security, policy management, information security and privacy, infrastructure protection law, regulatory and compliance standards for cybersecurity, cybersecurity, cybercrime, transportation systems security, industrial control systems’ security, and more. He has co-authored with Allan McDougall on the Critical Infrastructure: Homeland Security and Emergency Preparedness (Second and Third Edition) and the Transportation Systems Security books, as well as co-authored/co-edited with Jacob Brodsky on the Handbook of SCADA / Control Systems Security (First and Second Edition) books. Allan McDougall is the Executive Vice President of Knowledge Advancement Solutions in Ottawa, Canada. A seasoned Asset Protection and Security practitioner, he has over 25 years between military, public sector and private sector experience in addition to being highly active within the research community. A former combat engineer, his approach to problem solving can be described as pragmatic. His public-sector experience has included service as the National Coordinator Security Policy and Projects at the Department of Fisheries and Oceans, senior positions within the Fleet Security organization of the Canadian Coast Guard, the Senior Inspector for Ports and Marine Facilities and as the Manager and technical authority for physical security at Canada Border Services Agency. Allan is highly active in several professional capacities. A member of the ASIS international Physical Security Council, he has been recognized within that association for his efforts to promote personal and professional development amongst practitioners. He has also been involved in the development of several international standards associated with human rights, workplace violence, and infrastructure assurance. He is currently actively involved in international efforts associated with the future of cyber security in the maritime domain and the evolving need for certification and accreditation. Allan holds several professional certifications, including the Professional in Critical Infrastructure Protection, the Certified Master Anti-Terrorism Specialist, the Computer and Information Systems Security Professional, the Certified Protection Professional and the Physical Security Professional. In addition to his three other co-authored works, he has been published in several trade association publications and spoken at several educational sessions, ranging from local colleges to the National Defense University in Washington.